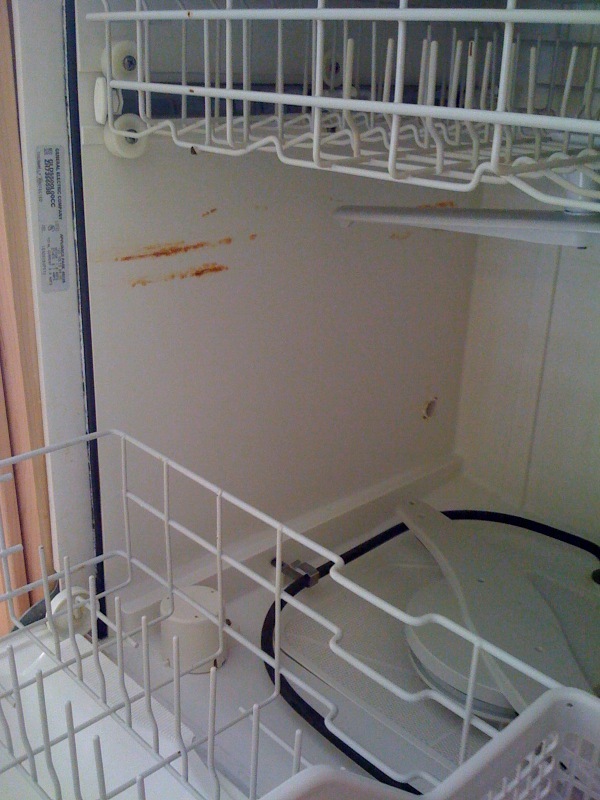 A common problem with dishwashers is that they form rust stains on the inside. 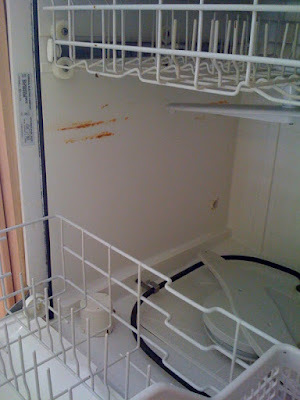 This happens because the iron in the water is reacting to the oxygen in the dishwasher and the air moisture. If you have city water (like me) the stains probably won't be that bad, but over time it really gives the interior of your dishwasher that dingy and "old" look. Here's a super quick fix! You may not care about what the inside of your dishwasher looks like, as long as it's getting the dishes clean. But if you're a little picky like me, or especially if you're selling your home, you want the inside to sparkle just as much as your dishes. It's the little things that buyers are looking for, and a clean dishwasher can make the appliance look newer and seem more efficient. Not to mention, any cleaning tips that require very little effort on my part are definitely worth it. I got this tip from the television show Get It Sold, but homeowners (and mothers!) have been doing this for decades. Lemonade! When life gives you rust stains... use lemonade! All you have to do is empty a packet (about 2-3 tablespoons) of lemonade mix into the soap dispenser, and run the empty dishwasher on a regular cycle. And there you have it. I used a Kool-Aid packet of lemonade mix myself. It's the citric acid that does the work. In fact, you can find at your local hardware and appliance store a packet of "special" citric acid dishwasher cleaner for about $12. Completely unnecessary. Use the Kool-Aid! It's only $0.25 and you probably already have it in your cupboard. Here are my before and after photos. The rust didn't completely disappear with just the wash, but the wash did loosen it enough to where I could simply wipe it off with a rag. This will also work if you have well water that is turning the entire interior of your dishwasher orange, but you may have to run a few cycles instead of just the one. Not to mention it'll make your kitchen smell lemony fresh! Holly, you're awesome! I love this post and the one about the upcycled baby-food jars. I've been wondering what to do with all the jars I'm accumulating! Thanks for following my blog! I'm now following yours too. Citric Acid is amazing in cleaning! At the end of the summer we needed to get all 50 of our sailboats back in great shape and even with being washed weekly they still got slightly grungy and stained. there is an expensive cleaner for like $12 for a small jar and the main ingredient was citric acid, so we went out and bought bottles of lemon juice and cleaned the boats and it was amazing how it worked! Yay for great and easy cleaners! Hi, I'm a new follower! 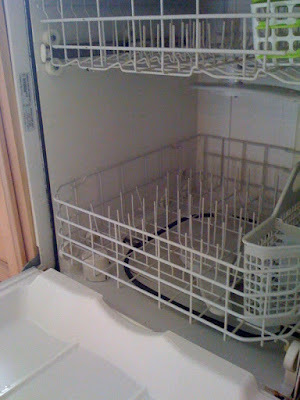 Great post, what a wonderful, simple way to get the dishwasher clean. Looks like I'm going to be getting a packet of lemonade! Thanks!